The fallout from the NSA spying scandal has left many people unsure about what they should and shouldn't share across the tubes. But now BitTorrent has an answer: an instant-message chat client that uses decentralized data transfer to keep your communications safe. 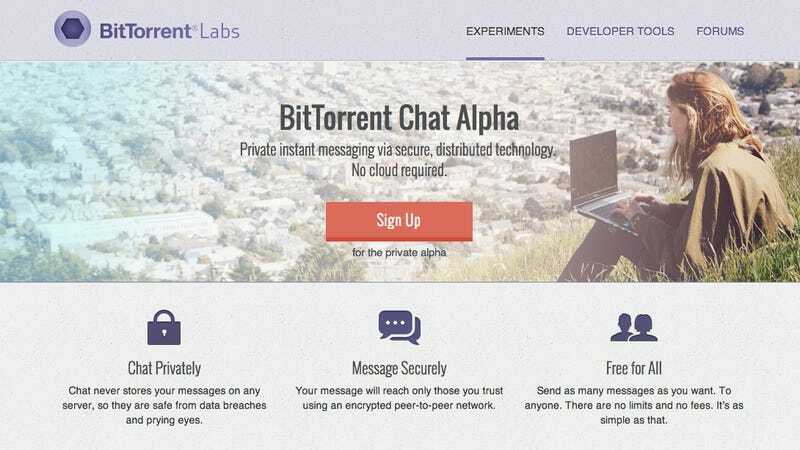 Just released as a private alpha—that means you need to visit the BitTorrent Chat sign-up page to get an invite—BitTorrent Chat uses a decentralized process to pass messages across the web while making them impossible to intercept as a whole. While BitTorrent is reluctant to explain exactly how it works, it's apparently "similar to BitTorrent Sync, but adapted for real-time communications." BitTorrent hopes that over time the technology will work with other instant-messaging accounts, but for now you're stuck with a dedicated BitTorrent account. It's also not clear yet quite how wide the OS web will spread—either desktop or mobile—but you'd expect at least Windows and Linux to be supported in the first instance.